Rt. Hon. Admiral the Lord Alan William John West of Spithead GCB DSC is a Labour Peer in the House of Lords and a former Head of the Royal Navy. Lord West joined the Royal Navy in 1965 and spent the majority of his career at sea, serving in fourteen different ships, and commanding three. In 2002, Lord West was appointed as the First Sea Lord and Commander in Chief of the Royal Navy, a post he held until 2006. He was also a member of the Defence Council and Admiralty Board as well as First and Principal Naval Aide-de-Camp to Her Majesty The Queen. 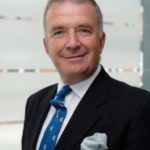 From 2007 until 2010, Lord West served as Parliamentary Under-Secretary of State and Government Spokesperson at the Home Office with responsibility for Security, Counter-terrorism and Police. He is currently Chancellor of Southampton Solent University and a board member of the Imperial War Museum. Lord West is also a member of the Top Level Group of UK Parliamentarians for Multilateral Nuclear Disarmament and Non-Proliferation.